Mr. Dufault leading the Marching Jays in a parade. I’m not sure of the year, but it looks like it’s the Minnesota State Fair parade. That is the style of uniform I wore from 1990-1993, but I think this might be slightly earlier than that. What’s the longest time you’ve stood in line at a wake? Wakes in Waseca are legendary—anyone who had lived in the community for a long time and was of good stature gained a lot of friends and admirers. It’s no wonder when they all turn up at a visitation to pay their respects. I stood in line for more than an hour on Friday night at the wake of my high school band director, Mr. Dufault. Teachers in small towns have a unique opportunity to touch so many young lives over the years. I was fortunate to have so many wonderful teachers in Waseca from kindergarten through high school. But there are the few teachers who rise to the top, and Mr. Dufault was one of them. My husband, who didn’t go to Waseca High, has heard me speak of my admiration for Mr. Dufault over the years. He often has joked that the Richard Dreyfus movie should be called “Mr. Dufault’s Opus,” instead of “Mr. Holland’s Opus.” He’s not far off. Some teachers show up, teach their subject, and go home. Some teachers go a little further and help students achieve not only academic goals, but also life goals. Then there are teachers like Mr. Dufault, who pored his entire life into creating the best marching band in the tri-state area. I think the thing that made Mr. Dufault stand out was that he clearly, truly cared that we succeeded. He was approachable, funny, and kind, but boy, could he also get mad. If it appeared at any time that one of the 160 students was slacking off or messing up, he got out his bullhorn and raged at us from on top of his wobbly metal stand, from which he lorded over us on the practice field. I remember him jumping up and down during one of these tirades and that metal stand swaying back and forth. Mr. Dufault’s son, Todd, who was one of the marching band staff, watched from below with deep concern, wondering if his dad was going to fall off or have a heart attack (or both). It’s not fun to be yelled at, and Mr. Dufault rarely had to pull that card. But when he did, you knew it came from a place of deep disappointment, not just mere impatience or from someone who simply had a short fuse. Big difference. We knew we had disappointed him. We respected and admired him, so we only wanted to do well and we beat ourselves up when we fell short. He inspired us to set goals and guided us expertly in reaching them. 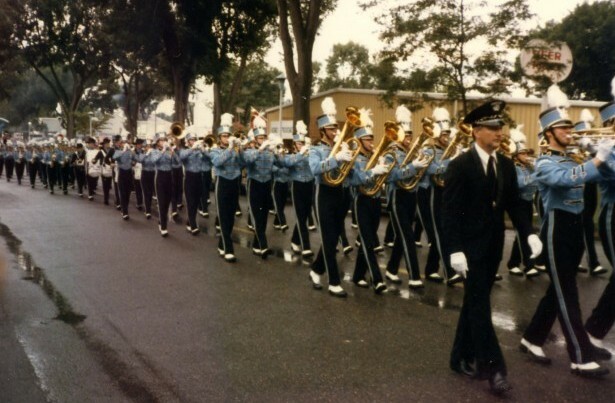 The 1981 Marching Jays, well before my time. But my sister is probably in this picture. Look at the size of that band! In Waseca, students WANTED to be in band; it was not a nerdy thing at all. Mr. Dufault was instrumental in creating that atmosphere. Setting goals and reaching them—what could be a better life skill to learn in school? I can’t think of one person who went through Mr. Dufault’s marching band program who did not become a better person because of it. Hundreds and hundreds of people came to the visitation and the funeral, and so many of those were former students of 20, 30, even 40 years ago. I needed to go to the visitation to pay my respects and to tell the family how much Mr. Dufault was an inspiration. The family has heard these stories over the years, for sure, but I hope it provided some comfort to see in one place the enormous impact Mr. Dufault had on all of us. A life well-lived, indeed. Some people’s spirits go barreling on in this world even after death. I know Mr. Dufault’s spirit will be one of those. My sentiments, exactly. Mr. Dufault was a man of great character, who made each person’s life better by knowing him. RIP. It’s hard not to think this about the man!